Explore the delights of Melbourne and come back to our cosy beds for a good night's sleep. Be it a stroll down the Queen Vic Market, a coffee from the city's artsy cafés or a quick bite of the delectable dumplings at Chinatown, you are a few steps away. 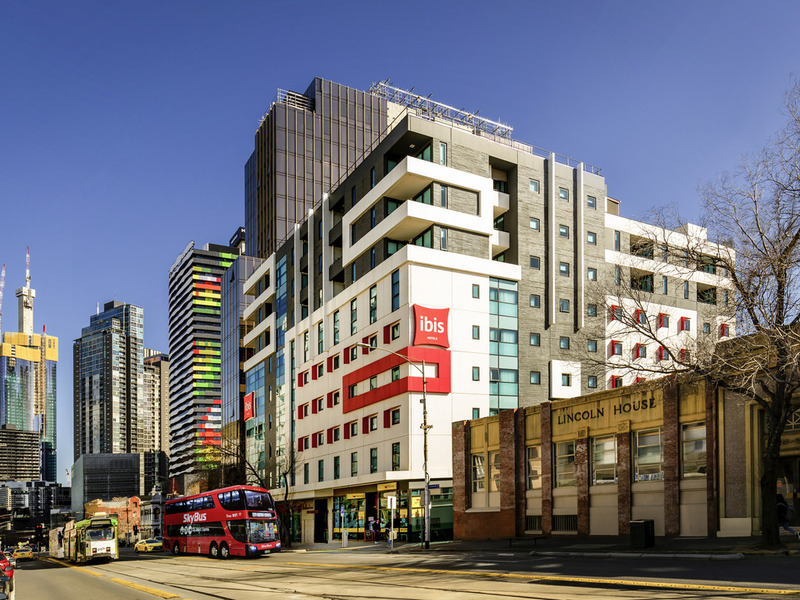 ibis Melbourne Swanston Street Hotel is a contemporary hotel conveniently located within walking distance of the city's iconic landmarks and tourist destinations such as the Queen Victoria Market and the Royal Exhibition Building. The hotel is an ideal base for first time visitors to Melbourne allowing easy access to the Lygon Street Italian precinct, restaurants at Gertrude Street and the Melbourne Central Shopping centre. All guest rooms, public areas and the lobby offer complimentary WiFi connection. Thi hotel is the ideal base for first time visitors to Melbourne allowing easy access to the Queen Vic Market, Lygon Street Italian precinct, restaurants at Gertrude Street and the mecca for shopaholics: The Emporium and Melbourne Central Shopping Centre ibis Melbourne Swanston Street Hotel is one of the most economic and contemporary Melbourne hotels. Within walking distance from the iconic landmarks and tourist destinations such as the Queen Victoria Market and the Royal Exhibition Building. Great value for money on convenient location. Welcome by staff was excellent and the recommendation for restaurant (when I asked) was spot on. Room was modern and clean with comfy bed. Love that I could open the window if I wanted to. On site restaurant looked great when I went there for refreshments. Breakfast staff were very friendly and welcoming. Excellent service. Will definitely stay here again. And having the tram right outside the door is a huge plus. Everything is great, clean and tidy, however, the housekeeping didn’t lock the door properly for 2 days after cleaning, lucky that I do not have anything expensive left in the room when I am out to travel. I was staying for 7 nights and was put to stay in a room facing Swanston Street. (noisy and shouting early morning) The staffs should have known it’s not a one or two nights affair. No EQ from people who are in the HOSPITALITY BUSINESS. I was allocated a room clearly meant for a disabled person - it had a huge bathroom and very small living space. It also had a connecting door to the next room - a door which had little ability to block out noise and light coming from under the door. On the third night of my stay, the woman next door had a visitor for a few hours of talking and noisy and sexual activity. Most uncomfortable. Hard to sleep. I turned on the TV with the sound turned up very loud so that I couldn't hear the sound. When I told the hotel by email about my experience they were most apologetic. The staff was helpful overall but the rooms needs to be a lot more cleaner. I discovered that there were hair strands on my bed and it made me question whether the sheets were changed at all. Well presented and very clean! Overall everything I found and encountered with the staff was very good . Very courteous , and very helpful. Facilities in the room was very good. Only thing it lacked was a waste bin in the bathroom. Fabulous staff and but clean & comfortable room. The shower was amazing! Friendly reception staff. Comfortable clean room. We arrived at the hotel on Friday night ok and when we got there we were told that they didn’t have a designated car parking space underneath the hotel for us to park our car so I had to leave my new car parked out on the street the whole night to which I wasn’t happy about and I couldn’t park it close to the hotel and we had to take our luggage from where we parked our car into the hotel so we had to make a few trips up and back. The staff at the hotel were accommodating and they managed to get a car park for us on the Saturday in the underground car park of the hotel. The room was nice very small tho. Breakfast was fantastic and dinner at the restaurant was great. Aircon didn’t work in our room Saturday night I did ring reception few times during the night to see if they could do something about it was told to wait half and hour and still nothing so didn’t bother calling them anymore but did mention it on checkout in the morning. It was ok for a budget hotel but don’t think we will be staying there again. Our stay on the first night was great. Our room was small but the room was very clean and quiet, the beds were very comfortable and I loved the awesome big shower. The reception staff were very friendly and extremely helpfull and nothing was too hard for them. Staff were very accommadating. After we arrived back from our New Zealand holiday we rebooked. The only negative comment on the second stay, was there was alot of noisy activity by other guests in the corrordor in the early hours of the morning. Constant door knocking and loud non-english conversations. This is something the staff can't controll. We highly recommend this hotel for a very comfortable stay and will stay there again next time visiting Melbourne. All staff at Ibis Melbourne were helpful.Rooms were great. Grand hotel for city stay. Initially was booked into a room that after one night was too small for a couple, so after requesting, at the desk for a room transfer to a bigger room for a few night stay ,we were catered for ,which was really appreciated.